"Protecting Your Information ... Protecting the Planet"
the environment by recycling 100% of the end product. The need for shredding has expanded far beyond destroying a few old documents that are out of date and past their useful life cycle. Utilizing PLANET SHRED's information destruction services effectively mitigates your risk by guaranteeing the proper disposal of your sensitive information. Today the need for shredding also includes the paperwork your office produces on a daily basis that too often ends up in the trash can. Much of that paper contains names, phone numbers, addresses and other confidential information of your clients and employees. Whether weekly, bi-weekly, monthly or periodically - properly destroying your confidential information can mean the difference between solid security and an accidental breach. 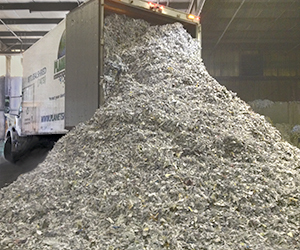 PLANET SHRED serves Monmouth County and Ocean County, New Jersey.